Central Goods and Services Tax (CGST) and Customs employees are concerned with the collection, administration and policy formulation of indirect taxes in India, i.e. central excise duty, customs duty and goods & services tax. Central Excise duty is a tax on the act of manufacture or production of goods. To levy Central Excise duty, it is necessary that a new article shall come into existence as a result of the manufacturing activity. Excise is collected on the goods manufactured or produced at the time of their removal from the factory for administrative convenience. Central excise duties on goods except tobacco; manufactured tobacco substitutes; mineral fuels, mineral oils and products of their distillation; bituminous substances; mineral waxes, have been subsumed in the Central Goods and Services Tax (CGST) after the introduction of GST w.e.f. 01-07-2017. Customs duty, on the other hand, is a tax on the goods imported into or exported out of the country. Customs duty is levied on the goods at the rates specified and the taxable event is the import into or export from India. In fact customs officers control the economic frontiers of the country both in the factual and the figurative sense. In addition these officers do border control services by regulating the import and export of goods and services in and out of the country. They work under the Central Board of Indirect Taxes and Customs (CBIC) constituted under the Central Boards of Revenue Act, 1963 (54 of 1963) in the Department of Revenue under the Ministry of Finance. Presently there are three classes of employees, i.e. Group ‘A’, ‘B’ and ‘C’. Zones of Customs, Customs (Preventive) and Central Goods and Services Tax : There are 21 zones of Central Goods and Services Tax and 11 zones of Customs & Customs (Preventive) spread across the country. These zones are headed by the Principal Chief Commissioners or the Chief Commissioners. Commissionerates of Central Goods and Services Tax, Customs, Customs (Preventive), Appeals and Audit : There are 205 Central Goods and Services Tax (including audit & appeals) Commissionerates performing executive functions predominantly concerning to collection of central goods and services tax. There are 56 Commissionerates of Customs and Customs (Preventive) (including appeals) implementing the provisions of the Customs Act, 1962 and the allied acts, which includes levy and collection of customs duties, surveillance of coastal and land borders to prevent smuggling activities. These Commissionerates are headed by the Principal Commissioners or the Commissioners. Selection to the Group ‘A’ service (IRS) is through the Civil Services Examination conducted by Union Public Service Commission (UPSC) through a three-stage combined selection process (a preliminary and a main written examination followed by interview/personality test) common for all the Group ‘A’ posts (IAS, IFS, IPS, etc.) called the Civil Services Examination. Recruitment to most of the Group ‘B’ service is conducted by the Staff Selection Commission (SSC) through a three-stage selection process namely the Combined Graduate Level Examination. Minimum physical standards are also prescribed for each category of posts. Group ‘C’ employees are also recruited by the Staff Selection Commission (SSC) through separate competitive examinations conducted on an yearly basis. Selection to Group ‘D’ posts were being done locally at the Commissionerate level. Sixth Central Pay Commission (SCPC) had recommended to stop this recruitment and to upgrade all the existing Group ‘D’ employees to Group ‘C’. This proposal has also been accepted by the Governemnt. All the posts carry the usual DA, HRA, TA, etc. Indian Revenue Service (IRS) Officer Trainees (Probationers) undergo a 3 month foundational training with their fellow officers from the All India Services and other Central Services (Group ‘A’) at the Lal Bahadur National Academy of Administration (LBSNAA) Mussoorie (Uttarakhand). This is followed by a 15 month rigorous professional training at the National Academy of Customs, Indirect Taxes and Narcotics (NACIN), Faridabad or Mumbai, where they are intensively trained in principles, concepts and advances in Management, Taxation, Public Policy and Law. Departmental examinations are also conducted by NACIN for the assessment of their suitability. All other officers, i.e., in the Group 'B' and 'C' cadres, are given on the job training and induction course at the Regional Centers of NACIN once they are appointed at various Commissionerates of Customs, Central Goods and Services Tax. Departmental examinations, under an approved syllabus and schedule, are also held on a half yearly basis before these officers are confirmed in their respective service. The officers joining in Group ‘A’ are posted as Assistant Commissioner of Customs, Central Goods and Services Tax, as the case may be. They get promoted upto the level of Principal Chief Commissioner/ Principal Director General. The post of Member and Chairman of the CBIC are now ex-cadre posts and appointments to these posts are done on a selection basis and not on promotion. The officers in Group ‘B’ (non-Gazetted) are posted as Inspector Central Goods and Services Tax, Preventive Officer or Examiner. They get their promotion to the next level Group ‘B’ (Gazetted), i.e. Superintendent of Central Goods and Services Tax, Superintendent of Customs or Appraiser, as the case may be. Promotion to Group 'B' (Gazetted) post is purely on the basis of seniority and fitness. The next higher post for all these three grades is the Assistant Commissioner in Group ‘A’. Similarly, in Group ‘C’ entry level officer is the Tax Assistant (TA) and the next higher level here is the Executive Assistant (EA). Tax Assistants are promoted to the post of Inspector Central Goods and Services Tax, Preventive Officer or Examiner, as per their option, considering the seniority and merit. Departmental Examinations, under an approved syllabus and schedule, are conducted for promotion from these posts on a regular basis by the NACIN. 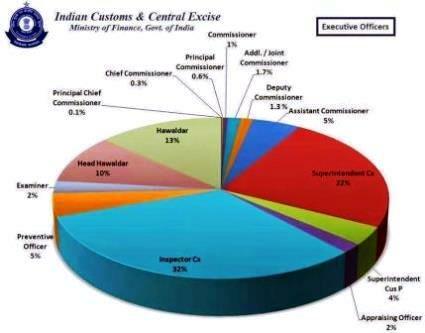 The officers of the Customs, Central Goods and Services Tax are also deputed to the Central Vigilance Commission (CVC), Enforcement Directorate (ED), Securities and Exchange Board of India (SEBI), Directorate of Revenue Intelligence (DRI), Narcotics Control Bureau (NCB), Special Economic Zones (SEZ), International Airports, etc. apart from the Ministry of Finance and the Ministry of External Affairs. In this era of liberalization and globalization, this department also has started modernising itself to meet the challenges arising out of multi-dimensional expansion of the world economy and has adapted itself to the changing contours of the economy. The actual focus is on the creation of a trade friendly service which can combat the evils of tax-evasion and smuggling in a painless manner. Though the pay and allowances in these services are lower compared to the private sector, the sense of satisfaction comes from directly contributing to the development of the country, as 50% of the Government revenue comes from indirect taxes collected by these officers. The service needs bright, young, honest, and dedicated people with a high sense of morality, integrity and love for the nation who can readily adapt to challenges in India's economic framework in the process of liberalization and globalization. * The details provided here is intended to guide the new recruits only.